Story: The only thing, which has been revealed about Shady is that she is mute, and she was one of Tamara Bryn Neil's knights who helped saving the World [1-3]. Equipment: Shady wears a force-field armor, which can form various weapons and shields for offensive and defensive purposes. 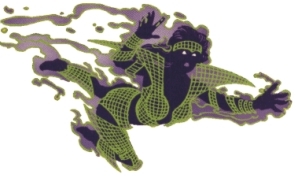 Shady's armor has the special ability to make her intangible which also gives her flight capability.